JAINA team is still in India and attending few more events organized by various Jain organizations. We will soon come out with details of our JAINA convention 2019 as the Convener and his team is working on this most important event of JAINA. From next newsletter we are starting different Kalyanaks and life events of Bhagwan Mahavir. Stay tuned for the interesting stories. You may want to go through the Webinar of YJA using the link below. Q 1: What is the Pran? Q 2: How many different Prans are there? The temple of Five Brothers is the temple on the left at the outer end. The temple has five large idols. The five brothers of Ujjain built it in the early 16th century. As you move forward in the Outer circle, a 16th century temple built by Vastupal,Tejpal is on the right. 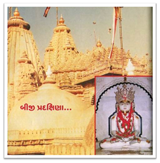 One day, lightning struck the main Adinath idol.Tarachand Sanghvi of Surat had a new idol made to replace it. When they attempted to remove the old idol, it would not move no matter what they tried. Even today, you can see a crack across the nose of the main idol. The new idol, called New Adinath, was consecrated with a grand ceremony in this temple, along with a pair of huge footprints. There was a King named Mahahari in the city named Kampilya situated in the sphere of this Bharata. He had a favorite wife named Mera.They had a son named Harisena whose birth was indicated through fourteen great dreams, who was brighter than gods and pleasing to all. Growing like the moon he mastered sixty four arts. He who was fifteen dhanusa (sixty feet) tall attained the auspicious youth. Fourteen gems were produced on some day while Prince Harisena was ruling after receiving vast reign from his father. After the acquisition of fourteen gems, he united six continents with Bharata. Being coroneted as Monarch he enjoyed pleasures for a long time. After having been saturated with worldly pleasures and due to lessening of the Karmas, same day he got detached to the worldly affairs and thought this - all prosperity has been up to me by dint of merits of the past. Therefore, he thought to achieve merits, because if the past merits are spent up without earning new ones the great plight may be created. Thinking thus great king Harisena took initiation and burnt up the wilderness of Karmas with the fire of pure penance. Glorious emperor Harisena having enjoyed the long life of ten thousand years accomplished absolute and indestructible - ultimate knowledge after the extinction of ghati - karmas that destroy the spiritual merits. Recently, Jain Center of Greater Phoenix celebrated 9th anniversary of the temple. During the celebrations they had Vidhan, Pujan, 18 Abhishek and Dhaja change. Here are some photos from the event. YJA had their first webinar this year based on the discussion of Ethical Investing. Check out the recorded video here if you were unable to attend the live webinar. It currently is Retreat Season!! Come enjoy a weekend with your fellow Jains and grow mentally, spiritually, and socially! Check out yja.org for your region's retreat and sign up now! YJA Young Minds - February 2018 Issue Check out the new issue of Young Minds at bit.ly/ymfeb2018! In our February issue, we've asked Jains from across the world to share what "home" means to them and how Jainism has aided and facilitated their journeys. These young minds are embracing failure, empowering women across age groups, spreading Jain values through education, questioning and seeking truth in their religion, disconnecting from technology, and curating art exhibits that explore how Indian Americans have shaped our nation. Hear from the grandson of Mahatma Gandhi on why high expectations are dangerous (“I didn't think I was going to be anything growing up.”) and from the first American Jain monk (“I was raised a Catholic.”) on what it means to be a true Jain.